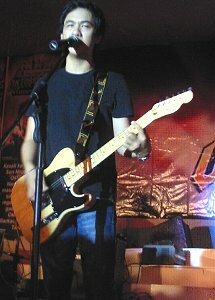 CATBALOGAN, Samar – Ely Buendia the popular vocalist of then Eraserhead, now with the band Pupil wowed the thousands of beer aficionados at the Samar Provincial Gym in a free concert on September 19, 2009. The free concert which started San Miguel Beer’s Oktoberfest also gave away t-shirts, mugs of beer, and other freebies. Booths for the San Miguel Shoot-out Challenge, Red Horse Beer Rock’s Greatest Hits, San Mig Light Speed Stackers and Gold Eagle Beer Videoke-han were made available. The “beerkada” were also given the chance to play in the booths. Local bands also took turns in entertaining the crowd mostly composed of young males but the house was rocked down with the appearance on stage of pop band icon Buendia. Despite the odd hours of the concert, beer aficionados stayed on until Pupil and Buendia left the concert venue. According to Voltaire Dela Cruz, Business Affairs and Communications in charge, Catbalogan was one among 29 other areas in the whole country that served as starting point in the Oktoberfest. “This year’s Oktoberfest will be a celebration of everything that brings delight to Filipino. This can only mean more San Miguel Beer parties across the nation and more surprises to be shared and enjoyed with a variety of SMB brands to choose from,” says Charmaine Bautista, San Miguel group band manager. In response to the demand of the consumers, the company will also offer the limited edition San Miguel Oktoberfest Beer which was first introduced in last year’s Oktoberfest. The special pale lager is known for its full flavor, malty notes, sweet taste, smooth finish and lower alcohol content. San Miguel Beer patrons may also win from other Oktoberfest activities. San Miguel Beer will be conducting house to house raids, bar tours and crown collection promo nationwide where consumers can also win cool premium collectible items. HONG KONG – The Asian Human Rights Commission (AHRC) welcomes the assurance given by the chairperson of the Commission on Human Rights (CHR) in the Philippines (CHR) that she would initiate "direct communication" with President Gloria Macapagal-Arroyo for the signing of the law on torture. In her September 22 email to Basil Fernando, executive director for the AHRC, Commissioner Leila De Lima, assured him of "our institution's (CHR) continued and relentless efforts, including the undersigned's direct communication to the President, for the immediate realization of the anti-torture law". De Lima's email was received five days after Fernando wrote her a letter [read open letter] asking her to initiate a direct dialogue with President Macapagal-Arroyo in explaining the importance of having domestic legislation on torture passed. Fernando wrote that "The CHR, as an independent body, would have had enormous weight in terms of influencing policy made on the part of the executive branch". The AHRC's appeal was made after unconfirmed reports about the possibility that the proposed legislation might be "vetoed" due to the exclusion of non-state actors from prosecution. The Office of the President (OP), however, has so far not made any official announcement about the reports of a "possible veto by the President of the bill". However, the CHR, also express concern over the delays in the signing of domestic legislation by the President, a month after the Senate and the House of Representatives have ratified the final version of the bill. The ratified bill has also not been transmitted to the President's office for her signature. Under the Philippines legislative procedure, the President could only act either signing or vetoing the proposed legislation once it received the ratified bill. Once the bill is received by the President's office, she would have 30 days to act on it. "We share your advocacy for the immediate signing of the long overdue and much needed anti-torture law. Like you, we are deeply concerned about the rumoured possible veto by the President of the bill, reportedly due to the exclusion of NSAs (non state actors) from its coverage," wrote De Lima. In addition to the CHR's assurance, the AHRC is also encouraging torture victims, their families and the non-governmental organisations inside and outside the Philippines, to continuously put pressure, particularly on the executive branch asking for the immediate signing of this bill into law. Torture victims and their families are encourage to write petitions and appeals letters addressed directly to President Macapagal-Arroyo to act on the measure promptly. TACLOBAN CITY – Four out of six Provincial Agrarian reform officers in DAR Region 8 were given new assignments in order to effectively implement Republic Act No. 9700 or the Amended Comprehensive Agrarian Reform Law. DAR 8 Regional Director John Maruhom requested DAR Secretary Nasser Pangandaman to issue a Special Order (S.O.) for the re-assignment of PAROs Oscar Reloj of Eastern Samar; Enrique Granados of Leyte; Venerio Yap if Biliran and Elisea Orapa of Southern Leyte. Under Department S.O. 415, series of 2009 issued by the Secretary, PARO Reloj was re-assigned to Leyte while, PARO Granados succeeded the former in Eastern Samar. PARO Yap took the helm of Southern Leyte, while PARO Orapa assumed office in Biliran. Consequently, the movement does not stop here, Director Maruhom said during the turn over of responsibilities by the affected PAROs. According to him, there would also be movement of field personnel if necessary. Director Maruhom disclosed that Region-8 as of the moment has still a balance of 83,000 hectares which is scheduled for distribution to potential agrarian reform beneficiaries (ARBs) until 2014 based on the phasing schedule as stated in the new law. Under the new law, the Department of Agrarian Reform (DAR) was given five years to complete the Land Acquisition and Distribution component. After the Senate and the House of Representatives consecutively passed Senate Bill 2666 and House Bill 4077, respectively, and finally the approval of the consolidated version by the Bicameral Committee on June 9 this year. R.A. 9700 was signed into law by President Arroyo on August 9, 2009 in Plaridel, Bulacan, however, the affectivity was retroactive to July 1. CATBALOGAN, Samar – Rural folks from the most remote towns of Samar eagerly await the deployment of the second batch of Nurses Assigned in Rural areas (NARS) program. In a phone interview with Matuguinao town Mayor Aran Boller, he said that his town yearns for the volunteer nurses especially so that in the first batch, nobody was assigned there. As the Department of Labor and Employment (DOLE) announced the influx of applicants, somehow, Boller was assured of five nurses in his remote Matuguinao. Matuguinao is a fifth class municipality struggling with a high malnutrition prevalence. San Jose de Buan, another remote and impoverished town, also await the coming of the second batch. Mayor Mila Rebato stressed that her Rural Health Unit has only a Municipal Health Officer (MHO), and five midwives, with no nurses. Though the lady mayor did not promise additional LGU allowance for her incoming nurses, she told PIA, she may look for funds to help augment the allowance given by DOLE and Department of Health (DOH). She added that the only nurse deployed during the first batch proved very helpful in helping MHO Dr. Phoebe de la Cruz carry out the health services in the hinterland of Samar. MHO Dr. Phoebe de la Cruz said the nurses will be able to help her grapple with malnutrition in de Buan. Matuguinao and San Jose de Buan are two of the farthest and poorest municipalities in Samar and that the deployment of the nurses to these impoverished areas will prove that the national government cares for them, said Mayor Rebato. The second batch of nurses are scheduled to render their first day of service on October 1 as the first batch of nurses started in April 1. NARS, a project of PGMA under the Comprehensive Emergency Employment Program (CLEEP) is designed for nurses to be deployed to their hometowns in rural areas to undergo six-month training in providing public health services and in performing clinical functions under the guidance of participating hospitals and other medical facilities. MAASIN CITY, Southern Leyte – The three Rural Health Unites (RHUs) around the city will soon have a smoking cessation clinic each. Simply put, this clinic will help people in the business of quitting smoking, gradually if needed, but the desired end must be to stop puffing cigarettes for good. The eventual establishment of these anti-smoking clinics has been the offshoot of the week-long Smoking Cessation Seminar held last month at Ampil Pensionne this city, said Engr. Othello Rich, City Planning Director and Coordinator of Healthy City Initiatives (HCI). During a recent bi-weekly “Maasin City In Action” block time program over DYDM, Engr. Rich said the seminar was actively participated by HCI enforcers, non-government organizations, physicians and nurses from the Department of Education (DepEd), and the religious sectors. An output of the activity was the formation of a technical working group (TWG) that would serve as the overseer of the city’s smoking cessation program. With the creation of the smoking cessation clinics, members of the TWG would serve as counselors and facilitators in advising people how to stop smoking, especially those who really want to but cannot just kick it off. Engr. Rich said the Department of Health (DOH) and the World Health Organization (WHO) had recognized the measures undertaken by the city government to promote the health of its constituents, and cited the campaign against smoking among these health-promoting initiatives. Earlier, City Mayor Maloney Samaco had imposed a total smoking ban in the city jail as part of the rehabilitation process of prisoners. The move caught the attention of other local chief executives who copied the Mayor’s example and, before long, the rest of the LGUs around Eastern Visayas followed suit, reported DYDM news anchor Zaldy Olita. Mayor Samaco also initiated the printing and wide distribution of no-smoking stickers in all passenger vehicles in the city, and posted huge tarpaulins in public places in a serious attempt to create awareness and make Maasin a smoke-free city. Next month, the city will vie for the Red Orchid Awards for 100% Smoke-free LGU, it was learned. TACLOBAN CITY – Police Region 8 Director Mario San Diego has ordered his men to leave no stones unturned in investigation of and identifying the assailants of Catubig, Northern Samar Parish Priest, Fr. Cecilio Lucero who was killed in an ambush on September 6. Police Chief Superintendent San Diego “deplored in the strongest terms this abominable act,” as he expressed optimism that the investigators in the field will be able to identify and bring the suspects of the abhorrent and despicable crime, to justice. “We will leave no stone unturned in the investigation of this incident,” Director San Diego stressed as he appealed to everyone who know anything about the case to inform the PNP. “I am also appealing to the public to wait the result of the investigation instead of making speculations regarding the motive of Fr. Lucero’s killing,” Director San Diego added. The PNP Director reiterated his earlier order to his men to fast tract the investigation for the early resolution of the Fr. Lucero ambush-slay. This, after the Special Investigation Task Group headed by Police Senior Superintendent Gil J. Hitosis, in coordination with the National Bureau of Investigation, has reported that it is coming up with composite sketch of the perpetrators based on the description and account of witnesses, to establish the identity of the suspects. The SITG also reported that the Regional Mobile Group 8 in close coordination with the 803rd Brigade, Philippine Army, is conducting checkpoints and maintaining police visibility along strategic areas in Northern Samar, in order to prevent similar incident from occurring. Based on the testimony of one of the witnesses during a follow-up investigation of the task group, on that Sunday morning of September 6, 2009 before the ambush of Fr. Lucero, the perpetrators were seen sitting atop a tomb in the cemetery as if waiting for somebody. At around 8:30 o’clock in the morning, a sudden burst of gunfire ensued and the witness saw the five armed suspects aiming their firearms towards the van-service vehicle which was being driven by Fr. Lucero. Fr. Lucero instantaneously died while Isidro Miras, Fr. Lucero’s companion in the van, who was wounded, was brought to the Northern Samar Provincial Hospital and later on was transferred to Divine Word Hospital in Tacloban City for further medical treatment. Another victim, Jose Laguda, a passenger of a passing jeepney who was hit by an astray bullet on his left foot, is now out of danger and has been discharged from the hospital. The remains of Fr. Lucero now lies in estate at Gamay, Northern Samar which is the hometown of the Luceros. QUEZON CITY – The World Health Organization (WHO) and the Philippine Center for Water and Sanitation (PCWS), with support from the Spanish Government, are implementing a project on safe water in Bicol and Eastern Visayas for 40,000 households in flood prone communities with outbreaks of water-borne diseases due to contamination of water sources. The project teaches the use of sodium hypochlorite 1.25% solution to treat drinking water and to store it safely to prevent recontamination to protect households against waterborne diseases until more definite solutions can be achieved. 10,000 households each in Albay, Sorsogon, Samar and Northern Samar relying on open springs and shallow wells for their drinking water will be provided a 20-liter water container and an initial three months supply of sodium hypochlorite 1.25% solution. The project is developing mechanisms to sustain efforts for household water treatment and safe storage as well as ensuring that low-cost sodium hypochlorite 1.25% solution is locally available. It also aims to increase the number of households practicing proper sanitation, hygiene, food preparation and storage. The project assists the Department of Health in reducing morbidity, mortality and suffering brought about by waterborne diarrheal diseases due to the unavailability of safe water supply in communities affected by floods. Household water treatment and safe storage (HWTS) is an effective way to prevent diseases from unsafe water. It lets people take responsibility of their own water security by treating and safely storing water themselves right at their own homes. TACLOBAN CITY – The Department of Environment and Natural Resources, through its Community Environment and Natural Resources Office (CENRO) in Borongan, Eastern Samar had distributed Free Patents to qualified land owners in that province. A total of 815 land titles covering an aggregate area of 766.67 hectares in three Eastern Samar towns were handed over to beneficiaries of government’s Handog Titulo Program in August this year. DENR Regional Executive Director Regidor De Leon says that the Handog Titulo Program is being implemented consistent with the goals of the Comprehensive Agrarian Reform Program (CARP) of President Gloria Macapagal-Arroyo which is to improve the lives of the farmers and their families especially those living in the countryside. CENR Officer Elpidio Simon of CENRO Borongan disclosed that on August 5, 2009 they distributed 409 Free Patents with an area of 338.78 hectares in Llorente, E. Samar. The Patent distribution was made possible in coordination with the local government unit of Llorente through Mayor Antonio Cardona. In Giporlos, CENRO Borongan participated in its 60th Founding Anniversary through the conduct of the Handog Titulo Program. A total of 255 Free Patents covering an aggregate area of 170.51 hectares were given to land owners during the Free Patent distribution on August 20 at the Municipal Plaza of Giporlos, E. Samar. Another 151 Free Patents with an area of 257.38 hectares were distributed in Balangiga in coordination with its local government unit under the leadership of Mayor Viscuso De Lira. Regional Technical Director Ramon Unay of the Land Management Service says that with the Handog Titulo Program, government services are brought closer to the people. “Land owners receive their Free Patents right where they are, instead of going to the offices of the DENR and the Land Registration Authority,” RTD Unay says of the Handog Titulo Program being conducted in the respective towns. Simultaneous with the Free Patent distributions, CENRO Borongan conducted People’s Day activities, delivering various services of the DENR on site. Applications for land titles were accepted on site. Likewise, issues and concerns on the different services of the Department were addressed or resolved whenever possible. The Free Patent Distributions conducted by CENRO Borongan were in coordination with the Land Registration Authority through its Provincial Chief Ida Sucion and the concerned local government units of Llorente, Giporlos, and Balangiga all in Eastern Samar. CATBALOGAN, Samar – Samar Provincial Peace and Order Council (PPOC) members and 18 mayors signed a “No to Violence” manifesto Thursday afternoon at the Wesamar Building, Catbalogan. The council meeting was presided by Samar Vice-governor Jesus Redaja (center). Also in photo is 8ID Commanding Genral MGen. Arthur Tabaquero and DILG Samar director Artemio Cañeja. In a special session of the Samar PPOC, the mayors and PPOC members affixed their signatures with the hope of ending killings. 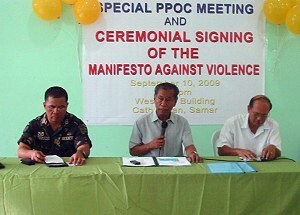 The series of killings especially in the urban areas of Calbayog and Catbalogan have prompted PPOC to conduct the manifesto signing. The PNP reported before the ceremonial signing, that the killings in the two urban centers have made them more vigilant, Deputy Provincial Director Biso said that the higher authorities have deployed a Regional Mobile Group and a Special Weapon and Arms Team (SWAT) to augment the PNP force. Meanwhile, the army reported that in Samar only 41 barangays have remained under the influence of NPAs, these, the army stressed are found in Calbayog, Motiong, Paranas, Jiabong, and San Jose de Buan. PPOC officials also urged the mayors to convene and activate their Municipal Peace and Order Councils (MPOC) that could help them strengthen security. Earlier, Local Chief Executives (LCEs) were alarmed by the killing of Matuginao Mayor Carlos dela Cruz. After the incident, Samar officials convened the PPOC to tackle the killings. In that meeting, the manifesto signing was proposed by 8th Infantry Division Commanding General Arthur Tabaquero, which the council approved. It cited that the group sets aside difference in ethnical, economic, cultural and political groupings with the strong desire for peace and development. As a group, they said, they want to express a moral voice that calls rejection of terroristic actions against the people. The soldier, identified as Sgt Arman Gavile, a member of the Army Engineer Brigade based in Rawis, Northern Samar was taking pictures of projects under the Kalayaan sa Barangay Project in the remote barangay. As he was about to board his motorcycle, three NPA rebels opened fire, Gavile was instantly hit and fell to the ground. The gunshots prompted his buddy, identified only as Carding to check where the shooting came from and immediately fired upon the opponents, such that, one NPA rebel later identified as Willy Malinao sustained an injury on his stomach. The two companions of Malinao fled, leaving their wounded comrade. The two injured protagonists were then brought to the Samar Provincial Hospital for immediate treatment. Doctor Rudolf Mabulay, Chief of hospital told PIA that Gavile is now in stable condition after a successful operation. He sustained injuries in his right arm, right leg and stomach. Meanwhile, Malinao who confessed that he hails from barangay Maputi in Zumarraga is scheduled for operation to remove the slug, which the doctor said is imbedded in his stomach. PADRE BURGOS, Southern Leyte – It’s still there. More than a week after hitting a shallow reef off barangay Tangkaan, this town, the 190-ton MT Shirley Ann tanker carrying 230,000 liters of automotive diesel oil is still glued in its position since running aground early morning of Saturday, August 29. The vessel had left the Petron depot in Mandaue City Friday afternoon on its way to Loreto town, Dinagat Island, but somewhere off the coast of barangay Tangkaan here its engines had trouble, and the ship was drifted by turbulent seas until it stumbled on a shallow reef. Maasin City Coast Guard station Chief Petty Officer Michael Romero had ruled out an oil spill, saying the ship had a double bottom, double hull body shape. In a follow-up call for updates on the incident, Seaman 2nd Erwin Libron of the local Coast Guard told PIA the salvage operation for the stranded ship has been scheduled by Friday or Saturday, September 11 or 12. He said by that time, the personnel and material from Harbor Star Shipping Services based in Manila shall be around to do the work of towing back the ship at sea. By “salvage operation,” Seaman 2nd Libron qualified that this meant more of a rescue mission to save the boat than an undertaking to gather scrap metals. When told that an earlier plan was to tow the boat last Friday, September 4, to coincide with the highest tide, Libron said this was not pushed through, as the company owning the ship preferred to wait for the Manila-based shipping services to do the job. Earlier attempts to pull the stranded ship using big ropes had failed, it was reported. Libron also confirmed that the oil spill boom is now in their station, and that this will be deployed around the ship when Harbor Services will be doing its task, to contain any possible oil spill that may accidentally happen while the towing work will be in progress. NORTHERN SAMAR – The Kinis Festival is celebrated annually and promotes Municipality of Rosario as ‘the Mud Crab Capital of Northern Samar’. Nortehanons and visitors are encouraged to join this exciting and entertaining celebration. The Festival will be a full-day event commencing 8am Monday, October 5, 2009 on the grounds of the Municipal Auditorium of Rosario. The Festival will include a wide range of cultural and culinary events and a market of local delicacies. The Municipality of Rosario can be reached by land transportation, 27kms from Catarman, the Provincial Capital of Northern Samar. The event is jointly hosted by the Municipality of Rosario and local NGO, Sentro ha Pagpauswag ha Panginabuhi (SPPI). SPPI supports the local economy through livelihood and enterprise development in sustainable agriculture and coastal resource management. The event is also supported by the local mud crab farmers of the Mangrove Crab Producer Association of Rosario (MCPAR) who are generously donating their product for various Kinis Festival events. Throughout the day there will be a marketplace of the 11 barangays selling handmade crafts, products and local delicacies. Special guest Australian Youth Ambassadors for Development based in the Bicol region and Manila will be running a recycled goods demonstration and workshop. Handbags made from recycled plastic and jewelry from paper will be on sale to support Filipino livelihood projects. TACLOBAN CITY – Major General Arthur Tabaquero, commanding general of the 8th Infantry Division of the Philippine Army, condemned the ambush killing of Fr. Cecilio P. Lucero on September 6, 2009. Fr. Lucero’s death is a great loss not only to the military but also to the Northern Samar parishioners. He was a constant partner of the military because human rights and peace which were his advocacies are aligned with the mission of the military, Col. Mario Lacurom of the 8th Infantry Division disclosed. The military is saddened over the death of a good friend in the maintenance of peace and order in the society, Colonel Mario Lacurom of the 8th ID said. Colonel Ranolfo Atendido, commanding officer of the 803rd Brigade of the 8th ID, in his spot report said that he immediately deployed a troop and two gunship helicopters to the scene of the crime to help in the hot pursuit operations. Colonel Atendido also condemned the inhumanly killing of Fr. Lucero who is a minister of God and of the Church. He also called on the public to join together in prayer for the eternal repose of Fr. Lucero and to continue their vigilance so that brutal crimes such as this will not happen again. He also assured the public that the Philippine Army will always be there as the protector of the people and the State. At all times the Philippine Army is expected to ensure, at all times, strict adherence to the supremacy of civilian authority over the military. In the fulfillment of their sworn duty, they must uphold the Constitution and the rule of law, protect civil liberties, observe due process of law and show healthy respect for human rights and human dignity. QUEZON CITY – A total of P1.1 billion has been allotted to provide Internet connectivity to a total of 9,048 public elementary and high schools countrywide, Catanduanes Rep. Joseph Santiago, chairman of the House committee on information and communications technology, said Sunday. Santiago said the fresh funding, contained in the proposed P1.541-trillion national budget for next year, would also cover the acquisition of additional computer sets for 577 public high schools. "Technology and the Internet are definitely taking on bigger roles in basic education – in providing essential instructional support. Our public schools cannot afford to be left farther behind," Santiago said. "It has become absolutely imperative for us to provide students and teachers alike greater access to the wealth of knowledge and information on the Internet," he added. As of April this year, with the support of private and non-government partners, Santiago said the Department of Education had managed to install computer laboratories in 4,019 public high schools. More than half of these schools are now hooked up to the Internet, according to Santiago, former chief of the National Telecommunications Commission. "We are now living in a world where Internet access is increasingly becoming a necessity, not a luxury. We have to ensure that every public high school graduate has ample computer literacy," Santiago said. Without counting the new P1.1-billion allocation for 2010, Santiago said the government intends to provide a total of 6,650 public high schools nationwide with computers and Internet connectivity by the end of this year. Gearing up Internet Literacy and Access for Students (GILAS) has been the largest private contributor to the push to improve the public school system’s access to computers and the World Wide Web. Led by the Ayala Foundation Inc., GILAS is a program driven mainly by corporations and non-profit institutions "that realize the need to invest in bridging the digital divide among the nation's public high school students." TACLOBAN CITY – Police Chief Superintendent Mario R. San Diego, regional director of Police Regional Office 8 issued an order creating a special investigation task group that will focus its efforts in the investigation of the recent ambush incident involving a parish priest and two (2) others from Northern Samar. The said Task Force will be headed by PSSupt Gil Jamila Hitosis, the Deputy Regional Director for Operations. The group is composed of CIDG, Criminal Investigation and Detection Group (CIDG), Regional Intelligence Unit (RIU), RID, Highway Patrol Group (HPG), Regional Mobile Group (RMG) and Investigation and Detective Management Division (RIDMD). Initial investigation conducted by San Jose Police Station disclosed that prior to said incident that Fr. Lucero and Miras together with PO2 Eugene Bation, were on their way to Catarman from Allen, Northern Samar. Upon reaching at said Barangay at San Jose town, they were ambushed or waylaid. Contrary to earlier sketchy reports that the victims were attacked by more or less 30 unidentified heavily armed men, two reliable witnesses informed that the assailants were more or less 4 to 5 in number. Victim Laguna who was on board a passenger jeep was hit by an astray bullet on his left foot. PNCO PO2 Bation managed to return fire towards to the enemy position that prompted the lawless elements to scamper in different direction of grassy and hilly portion of said place. The same PRO 8 dispatch informed that PSSupt Eusebio Adamero Mejos, Provincial Director Northern Samar Police Provincial Office, together with elements of San Jose Police Station immediately responded to the scene and conducted Police Operations for the possible arrest of the fleeing suspects. Meanwhile the spot investigation conducted by the NSPPO SOCO and investigation personnel that immediately responded to the crime recovered thirty five (35) pieces empty shells and one (1) live ammo of M16 rifle. Right now the SITG composed of the members of Regional Mobile Group 8 and Highway Patrol Group has already called for the strict enforcement and setting up of more police checkpoints in the area. TACLOBAN CITY – The 19 crew of MV Hera, a Panamanian vessel which departed from Papua New Guinea on August 29 bound for China and which capsized on September 4 due to turbulent weather, have been rescued at sea by a local fishing boat, in the early morning of September 7. The crew composed of four (4) Koreans and fifteen (15) Filipinos, was brought by the civilian motorized banca to Santa Monica in Oras, Eastern Samar. In Oras, the local government led by Mayor Neil Alvarez attended to the immediate needs which include food, medicines and clothing, of the survivors. The Operations Center of the Regional Disaster Coordinating Council of Region 8, received a report from the Tactical Operations Group 8 of the Philippine Air Force that a foreign vessel was reported to be listing and taking in water at 9:30 in the evening of September 6. The last reported position of the foreign vessel was at the vicinity of Tubabao Island, Dolores, Eastern Samar. The TOG 8 deployed two choppers at 6:30 in the morning of September 7 to conduct Search and Rescue Operations. The Philippine Coast Guard based in Catbalogan, Samar also conducted SAR operations. Rodolfo Valdez, a crew of the MV Hera informed the RDCC8 that on September 4, 2009, the crew members experienced bad weather and big waves. On September 5, the crew discovered a crack that extended or expanded due to big waves and water coming in, causing the boat to tilt and capsize. At 4:00 o’clock in the afternoon of September 6, a distress call was made and at 6:00 o’clock in the evening, the crew abandoned ship. The crew members stayed in the waters with a life raft for 9 to 10 hours before they were seen by a passing fishing boat and were towed at 4:00 o’clock in the morning until they reached the shoreline of Santa Monica, Oras, Eastern Samar, at 8:00 o’clock on the morning of the same day. The Philippine Air Force choppers brought the survivors to Tacloban and later on brought by Central Command helicopters to the company agent in Cebu.